Pain is an unpleasant sensory or emotional experience that exists in the mind of the one who is experiencing it. Since animals can’t explain their pain, people have long assumed that pets don’t experience pain to the same degree as people. Although general anesthesia keeps them immobile and oblivious to any pain during surgery, pets have historically been under-treated for pain. “We have never really trained veterinarians to think about pain associated with disease,” says Dr. William Tranquilli, professor of clinical medicine at the University of Illinois. The Companion Animal Pain Management Consortium is trying to change that. Leading the charge are Dr. Tranquilli; Dr. Charles Short from the Center for the Management of Animal Pain at the University of Tennessee; Dr. James Gaynor, associate professor of anesthesiology at Colorado State; and Pfizer Animal Health, a pharmaceutical company with U.S. corporate headquarters in New York (www.pfizer.com/ah/index.html). Advances are driven in part by owners who don’t want furry family members to suffer. Today, veterinarians and owners recognize that pets do suffer pain just like people do – they just express it differently. Damaged tissue releases chemicals that sensitize nerve endings. Response to pain travels through the nervous system up the spinal cord to the cortex of the brain, where pain registers and triggers a protective reflex. This “learned avoidance” teaches pets to thereafter steer clear of the candle flame, for instance. Pain also prompts a pet to protect or rest an injury so it heals. Not all pain is severe or sudden, or requires heavy-duty analgesics. “Long-acting steroid products given to reduce inflammation of the skin are a type of pain management,” says Dr. Tranquilli. So are antibiotics that cure a sore throat, while chronic joint pain typical in older pets can be relieved with a heat lamp. Allergic pets get temporary relief from cool water, which is a natural anesthetic for skin, says Dr. Shawn Messonnier, a holistic veterinarian and author practicing near Dallas. Extreme pain, though, prompts a stress response that alters immune function, interferes with blood clotting and wound healing and adversely impacts the cardiovascular system. Extreme pain can permanently alter neural pathways, creating a neurological “memory” so that pain continues long after the injury has healed. Because chronic neuropathic pain is extremely difficult to treat medically, human anesthesiologists prevent this condition by incorporating a nerve block along with general anesthesia. Pets can also be given a local anesthetic into the spinal cord to act as a regional nerve block that prevents the pain message from ever reaching the brain. “Recent studies show if we preempt pain by doing medical therapy before we make the incision, pets don’t need as much post-surgical medication,” says Dr. Messonnier. Preemptive pain therapy also reduces the amount of general anesthetic required, and alleviates post-surgical side effects. For example, preemptive pain control in chest surgery promotes easier postoperative breathing because drawing deep breaths is not as painful. Dogs tend to be obvious about their discomfort. “They scream at you,” says Reding. When Stephanie Harpham’s six-year-old pit bull, Chaplin, suddenly began crying a lot, she knew to get immediate help. “I could tell it hurt him to move,” she says. It’s also hard to generalize about pain symptoms – each pet is different. Two years ago, Reding’s Australian shepherd, Gibson, just didn’t act right. “He was a little slow. He’s a big chow hound, and I had to urge him to eat,” says Reding. The exam revealed a potentially life-threatening pyothorax – an infection in the chest. Many prey species (birds, hamsters) instinctually hide their pain, and some dog breeds (pit bulls, terriers, hunting dogs) are insensitive to pain when working, but that doesn’t mean they don’t hurt or aren’t injured. Experts suggest that if the same condition would be painful in a person, then assume it’s painful in the pet. Drugs can be used to control pain at any point along the nerve pathway, but pain tolerances vary from pet to pet just as they do in people. “In humans there is about a five-fold variation in pain tolerance for the same surgical procedure,” says Dr. Tranquilli. A one-size-fits-all approach won’t work. The most common analgesics are over-the-counter non-steroidal anti-inflammatory drugs (NSAIDs), i.e., aspirin, Tylenol®, Advil®, etc. NSAIDs can be very helpful for a variety of painful conditions, including cancer. “They didn’t find Chaplin’s cancer until he was in too much pain to move,” says Harpham. Although prednisone increased his “accidents,” she only cared that it gave him great pain relief. When prednisone stopped working, the pit bull was given the NSAID piroxicam (a human drug) that not only relieves pain but also prompts remissions in some canine bladder cancers. “Piroxicam worked amazingly well,” says Harpham. Pets metabolize drugs differently than people, so remember: Human medicines may be toxic to pets and should never be given without a veterinarian’s approval. Cats in particular are very sensitive to pain medicine. 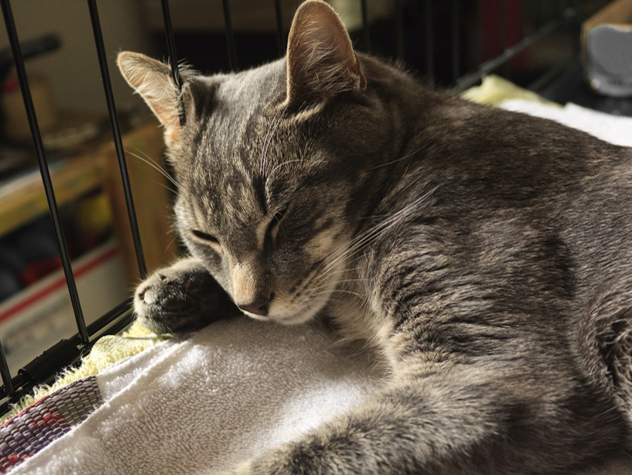 NSAID drugs for dogs such as carprofen (Rimadyl®) and meloxicam (Metacam®) can cause toxicity in cats, says Dr. Susan Little, a feline specialist in Ottawa, Ontario. Acetaminophin (Tylenol) should never be given to cats, and even aspirin can be toxic; it should be used very sparingly and only as prescribed by a veterinarian. Dr. Little says drugs like oxymorphone and butorphanol work well in cats to control post-operative pain for elective procedures such as spays, neuters or dentistry. Ketoprofen, an anti-inflammatory drug helpful for arthritis relief, is often used in combination with other pain relievers. For example, Winky’s cancer biopsy was so deep and painful, the cat couldn’t use that foreleg. His owner, Mary Williams, took the Scottish fold to specialists for treatment, including pain control. “Winky seemed to rest more comfortably, and he’d move around more on three legs when he’d had the ketoprofen,” she says. Narcotic pain relievers such as morphine, codeine and Demerol® are only available by prescription from the veterinarian. Orthopedic surgeries are quite painful and are often treated with morphine or a morphine-derivative drug. Buprenorphine, 25 times more potent than morphine, takes longer to work, but lasts longer for severe or chronic pain. Pet owners may be given torbugesic in an oral delivery mixture – Torb-in-Syrup® – to rub on the pet’s gums for absorption through the mucus membranes. Codeine is well-absorbed in the dog and cat digestive tract and provides effective relief for all but the most severe forms of pain, such as that associated with cancer. Codeine can be compounded into peanut butter or fish paste for better pet acceptance. After surgery, drains can deliver continuous pain relief into the chest and abdominal cavity, the joint, or even intravenously via a catheter. Chemotherapy and radiation can also relieve certain kinds of cancer pain. Reding’s dog, Gibson, needed a chest tube to clean out the infection, and she knew that penetrating the chest cavity is very painful. “Giving him morphine only relieved the pain to a point. For the first day he didn’t want to move or stand up,” she says. A Fentanyl patch began to work after the first 24 hours. “After three to four days, Gibson was running around like there was nothing wrong with him,” she says. After another few weeks on antibiotics, Gibson fully recovered. Dr. Messonnier advocates using conventional drugs integrated with alternative pain management therapies. Hydrotherapy (water), massage, magnets, chiropractic and acupuncture are common options. Shepherd/collie Sophie rebounded quickly from tumor-removal surgery, and Daiter consulted with several specialists for ways to relieve her dog’s cancer pain. Therapy included several conventional pain medications, along with dietary changes, acupuncture and massage. “Sophie especially liked massage – she liked to be touched,” says Daiter. Dr. Messonnier agrees that drugs work best for immediate relief of acute and severe pain, while herbal, homeopathic and nutritional supplements are most helpful for chronic conditions. “For a dog with arthritis, I would use a drug like Rimadyl for a bad day, and use glucosamine and acupuncture for a long-term approach,” he says. Canine disk disease might be treated with a combination of acupuncture and a homeopathic remedy called Hypericum (veterinary strength, not over-the-counter) for nerve injury. He says homeopathic Arnica is helpful for any sort of trauma or wound, and also recommends a proprietary herbal mixture called Post Care to control the bruising, swelling and pain associated with surgery or trauma. Light therapy also has applications. “My Cornish rex got on the wrong side of a dog and was bitten on the hock,” says Claire Marsh of New Zealand. With veterinary care, Ren’s wound healed fine, but the four-year-old cat remained lame. X rays showed a detached ligament with a bone chip. “The vet felt Ren would be lame for life,” says Marsh. Then a friend loaned her a Bioptron light. Ultimately, treatment is based on what an owner is able or willing to do for a pet. “There is no right or wrong,” says Dr. Messonnier. Twice-weekly acupuncture may not be possible for those who don’t have transportation, so they prefer to give pills. “There is an additional cost for pain relief,” says Reding. Clinics may charge an extra $40 to $60 for a Fentanyl patch, for example. Some clinics cut costs by eliminating pain medicine, says Dr. Messonnier. “Don’t assume your veterinarian already uses pain management,” he says. “If the spay only costs $50, a light needs to go off – ask!” Be aware that anesthetic does not address pain. Dr. Messonnier says that ketamine (a common injectable anesthetic) only controls superficial pain, and does not block the visceral pain that results from spay surgery. The latest research makes it clear that pain is an important health issue for cats and dogs. Whatever their condition, providing proper pain management always enriches their quality of life and can help them recover more quickly and completely. It’s also an ethical obligation. For those who love cats and dogs, making the hurt go away is simply the right thing to do. Amy D. Shojai, of Sherman, Texas, has written a dozen books on dog and cat health care and behavior. For a list of titles, visit www.shojai.com. 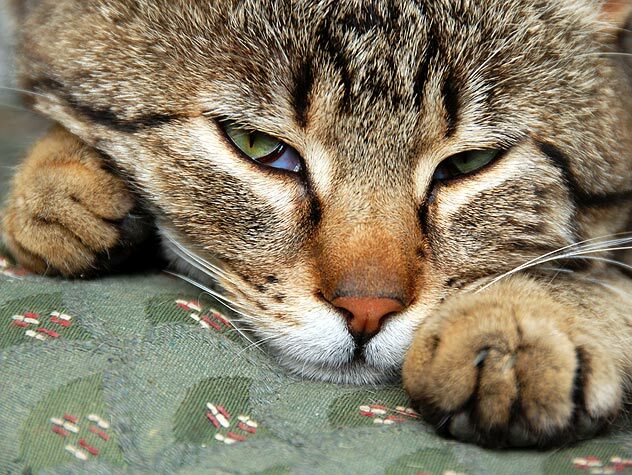 Learn about effective arthritis treatment to help your cat.